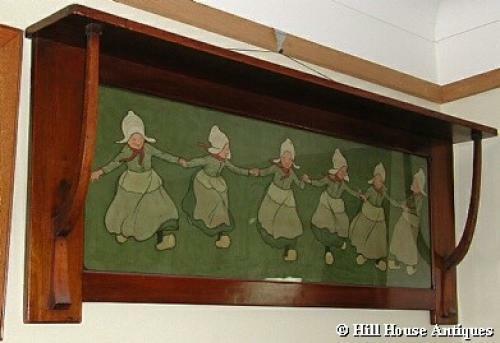 Charming Liberty & Co (labelled) stained beech Arts & Crafts picture/overmantle containing an original coloured lithographic print after Cecil Aldin of six Dutch girls, circa 1900; known as"The Leyden". Liberty label to reverse. Cecil Aldin produced a companion pair to this scene, of six Dutch boys - see the other Liberty & Co, in oak, overmantle (larger version with extra shelf) also on website ( now sold) with the boys version. Illustrated in the Liberty & Co Yueltide Gifts 1901 Catalogue. Approx 4ft wide and 19.5 " high.